David Ramey, winemaker and proprietor, shoveled his first grapes in 1978, after attending UC Santa Cruz and then later to Davis for a masters in enology. 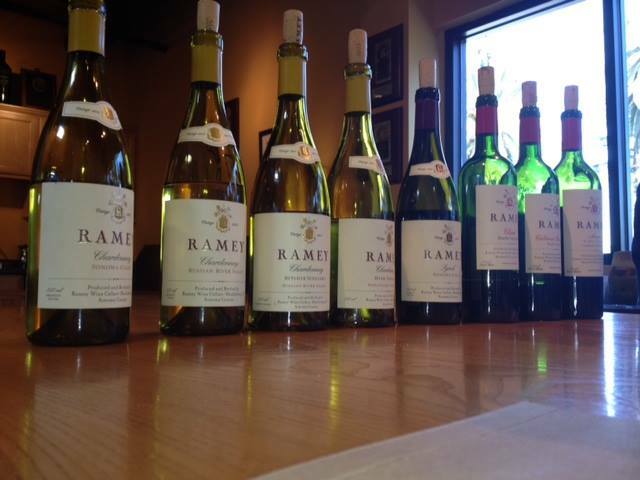 Ramey’s first harvests were in Sonoma in ‘78 and France in ‘79 at Jean-Pierre Moueix. (Petrus was one the wineries also managed by Moueix.) Ramey came back in ‘80 and then spent the next 22 years at Simi, Matanzas Creek, Château Petrus again, Chalk Hill, Dominus and Rudd. In ‘96 Ramey had the opportunity to make his own wine, a Chardonnay from Hyde Vineyard. Once his wife agreed, he made 260 cases in his first vintage. Today Ramey has released the 2011 from the exact same vineyard. Ramey Wine Cellars makes 40,000 cases, in what Ramey calls a “large small winery.” Co-owned with his wife, Ramey has no partners or investors. Ramey told us that he purchased a vineyard with an old “Hop Kiln” on the property. He plans on converting the hop kiln into a tasting room and building caves for a winery. The property sits along the Russian River and is called Westside Farms. It has 42 acres planted to Chardonnay and Pinot Noir. He is working on the permitting process now and would like to complete the project by 2017. In 1987 at Matanzas Creek Winery, Ramey was one of the first winemakers in California to whole cluster press Chardonnay grapes, and he is considered a legend in the industry. His Chardonnays are made in a French Burgundian style and flavor, and he goes for more “lift” with California ripening grapes. None of the wines are filtered; they are fined using traditional French methods. Communications Director Alexandra O’Gorman led us through a tasting of four whites and four reds. The only one that was cloudy, definitely due to being unfiltered; oak, butter, crisp apple; tart apples, white pepper, nice bite with a long acidic finish. Like a Sauvignon Blanc with some oak notes. Lemon lime, grapefruit, vanilla; toasted oak, same fruit, not as acidic a finish, more balanced. Pear, cinnamon, creamy; tart, acidic, oak more prominent on palate, nice balanced finish. Rose gardens, butterscotch, medium toasted oak; more oak, moist yet dry, tart Granny Smith apples. Balanced fruit and spice on the nose, including cherry, menthol; great dark drying fruit, not too peppery, ready to drink. Velvety rose, plum, cigar box; deep and dark fruit, not too much pepper, lovely balance. *As far as any issues caused by the drought, in 2014 Ramey received 20% more fruit than anticipated. Touring the outdoor winery with our charming winemaker, Antoine Favero, proved to be a hoot! Favero’s wit and charm got me past any fear of climbing stair after to stair to get a view of sweet bubbling fermenting grape juice, the local Sonoma airport and piles of reusable grape compost. We also tasted sun-sweetened Cabernet grapes in their clusters fresh from harvest! Most of the harvested grapes are only fermented via natural yeast according to Favero. The winery was built in the ‘80s and is one of the rare ones that is all outdoors. The barrel room didn’t have any electric cooling units; instead the unique ceiling was built to bring in the cool air, and, as an added gift, it was beautiful to look up at. 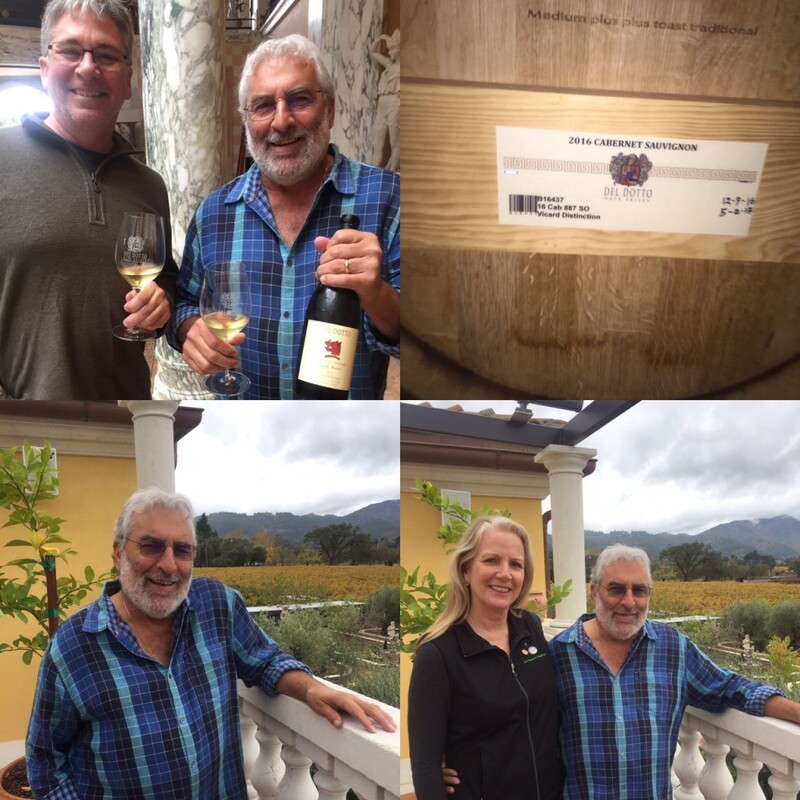 After my travel pal Claudia Sheridan practiced the art of “punch down” we returned to the tasting room to sample a few award winning wines (see tasting notes below) and later, enjoy a picnic lunch with Favero. Oak, cream and butter aroma notes followed by tart lemon lime and creamy finish. Red cherries, mint; spicy, light tannins, long finish. More mature darker fruit, bursting cherries, dusty plums, charred oak; pungent dark fruit, greet-me-in-the-face spice and pepper. Red, blue and black fruit, black pepper, dark dry chocolate; blue fruit, chocolate again. Milk chocolate, cracked green pepper, spicy; Nice balance of fruit and spice, drink now with or without food, just go for it. Perfumy nose, flower garden, dark fruit, cracked black pepper; intense, spicy, very good. Not sure how many locals had mentioned Hourglass Winery to me but enough that my whistle was sufficiently whetted. I sought out an appointment and, lucky for me, gained admission. Driving up a small road off the Silverado Trail in Calistoga a small brass sign depicting an hourglass led me in the right direction. At the end of the drive we parked near a small private home and walked up to the winery. Its size and scope immediately impressed me, and I would soon attribute the same characteristics to CEO and Founder Jeff Smith: I would be blown away not only by an incredible tasting but also a vast winemaking knowledge I had yet to completely understand. My hand whizzed over my notepad as fast as it could to keep up with Jeff’s family story, his own story and, when prompted by his mother that wanted him to prove himself worthy of turning her Calistoga property into a winery – his depth of understanding what it takes to make killer wine. Note to my winemaking friends: I have my notepad and you can read it all for yourself if you ask me nicely. Some of the notes I have shared here are designated as For The Wine Geek. The cave we had our meeting in was created when extra dynamite was left over after making the barrel caves. Smith said something along the lines of, “We have extra dynamite, let’s blow something up!” And this cave was unlike any other I have seen, with fur covered chairs and inventive lighting…I kept waiting for the bear to show up. Which, now that I knew Smith’s sense of humor, he had a bear story too. Jeff’s family moved to the area in 1964. St. Helena was a sleepy town until the Judgment of Paris. His father built the Wine Country Inn about a decade later. They planted fruit trees over the many acres of rocky land that they owned. It was at a cocktail party with Dan Duckhorn that his father was told he shouldn’t waste his time with fruit trees, he should plant Zinfandel vines – and he did. When Jeff’s father passed away in 1990 Jeff took over the vineyard. His mother was ready to sell by then, but that’s when Jeff convinced her to pull out the Zin to make room for Cab. Jeff was only 26 at the time. He was fiddling around in college and in a band, but he was watching his neighbors. He decided to get some help from a pal at UC Davis, got them to look at his soil, and learned he did indeed have a great site. Now here is where my notes veer into the geography of the land (streams, soil, gravel, minerals that combined would represent the “tip of narrow crossing” of an hourglass), the varietals grown (all five Bordeaux varietals), the mentors that would guide Jeff (Bob Foley helped with the early vintages, then came Tony Biagi who is the current winemaker) and his thirst (forgive the pun) in what seemed to me as a quest to learn it all. For The Wine Geek: I asked about the use of the “cult” name and how it might relate to Hourglass. Jeff said there are only eight cult wineries, no more, and they are credited with defining a paradigm shift in winemaking and the high ph movement. And the movement “grew” out of the cult wine phenomenon. 2015 HG3 Hourglass Red Blend was what Jeff referred to as a “Bordelaise Stew”, it was different each year, with Merlot, Cabernet and one other, to-be-decided black fruit. The aromas alone that reminded me of incense Jeff said was sandalwood. 2015 Blueline Estate Cabernet Franc was destined to be my favorite. With aromas of wet gravel, a juicy palate and cigar – Jeff said this wine would only develop over time. For the 2015 Blueline Estate Cabernet Sauvignon this time I got aromas of next day Bolognese spaghetti sauce, only because the second day is so much better than the first. The spice, blue to black fruit and killer aromatics brought up…you guessed it…a lesson in how those aromatics develop. For The Wine Geek: Somehow they can stop/suspend the polymerization during fermentation to shorten the tannins. “Unresolved tannins” is like that tea bag that steeped for too long. A “wet chemist”, that would be hired from veraison onward, would be the person to manage (and explain better than I can) this suspension process. Lastly, For The Wine Geek: As we were just about to say our goodbyes we got into a discussion about what influences people about wine. Jeff said that winemaker Clark Smith (Clark was in Santa Clarita once for a holiday tasting at Valencia Wine Co. where I met him the first time, and a second time when we judged together for the Long Beach Grand Cru.) did a “chemistry class” where different music was played while each person judged a wine. After more than three tries in rating the same wines in the same order – but with different music – Jeff got different results. He remembered what he had rated the wine before, and the wines were in the same order, but his results were still different! Beach Boys, jazz, hard rock, classic, classic with a modal change…each presented a new result. Jeff said his notes would “flip again and again” and possibly due to “input creating a change in the chemical pathways…” Totally going to try this myself! No one in the Hourglass family lost their home, however two of their consultants did. The winemaking crew stayed on, lost power at one point and a neighbor helped them out. When their neighbor lost their power next, Hourglass was able to help them. The fire ran 100 feet per second according to CDF. They did lose some fruit from Sonoma that would’ve been used for HG3. Our goal with winery visits is to immerse the enthusiast in the art of what we do. We seek to create an intimate experience that will deliver a greater depth of knowledge of winemaking in general and a look behind the scenes at how we apply that craft. When you visit with us, plan on an hour to an hour and a half immersion that will take you into the core of the winery to include a tasting of aging wines at rest in barrel and current bottled releases. 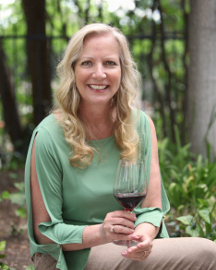 The experience will be guided by either Proprietor Jeff Smith, Operations Manager Marybeth Egner, or Director of Private Clients Ian Fenwick, all of whom have deep knowledge of Napa Valley and are well versed in every aspect of our winemaking…read more. 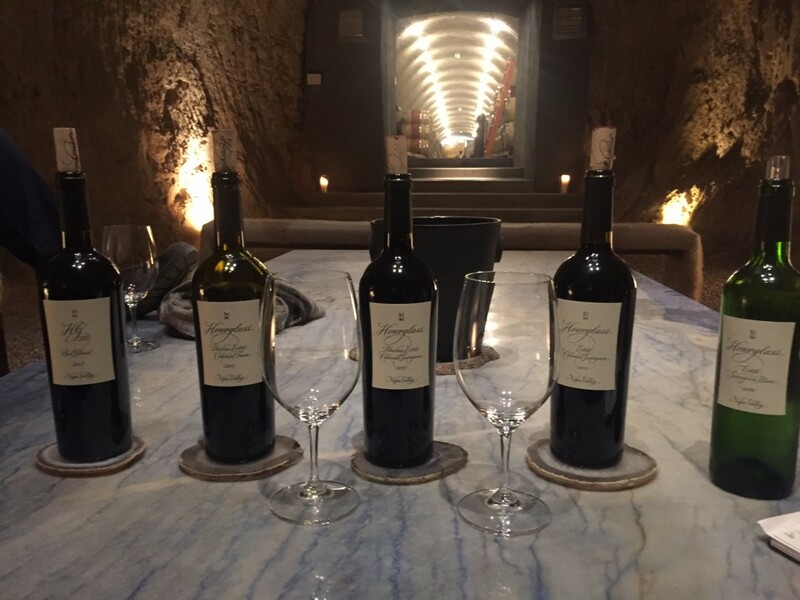 Been to visit Del Dotto Vineyards Estate almost annually for ten years now, covering their amazing cave tour and tasting for Elite magazine, Eve’s Wine 101 and the SCV Beacon. I have never had an experience like it: After entering the subterranean entrance, guests are greeted with expansive views of marble floors and Venetian glass chandeliers, a large tasting bar…and then you notice the private bars set up around the room, and a large curtain off to your right that, when opened, reveals the long path of barrels – many with different oak expression from different sources – and expectantly you’ll follow their guide and his wine thief to what will truly be a most remarkable tasting. This time we started at the bar with a tasty sip of the 2015 Chardonnay from the Cinghiale Vineyard, a Family Reserve, while Gerard Zanzonico, Del Dotto’s winemaker of ten years, shared his stories on the recent fire. No Del Dotto employees lost their homes, though some of the grapes still hanging came back from the lab with “smoke taint” and therefore could not be used. During the fire roads were closed, however winery workers that wanted to (and were able to) come in worked with Gerard doing pump overs. The whole town was evacuated. Rumor is that the cost to rebuild homes in Santa Rosa has skyrocketed to $1,000 per square foot. As we followed Gerard into the caves we stopped to try a barrel sample of the 2016 Cabernet Sauvignon Vineyard 887 in French oak. We are the first to taste this according to Gerard – and there would be more than one first! Really got a nice flavor of black fruit and toasted oak. This would be one of many to watch when it’s released. We tried the same wine in a different French oak – Fouquet Margaux – here, as Gerard explained, the oak wasn’t as integrated. For me it was a bit less dark and brooding, and equal in quality, another to watch out for. The wine thief then stole a taste of another we were the first to taste: 2016 St. Helena Mountain Cabernet Sauvignon in French oak. Gerard said this one had earned a full 100 points in the past from wine critic Robert Parker. (A full 50% of this Cabernet was destined to go into another grand Cabernet, The Beast.) This wine retails for about $200 a bottle, which works out to about 60k a barrel. Why would we need to know the cost of a barrel? As some people – a few – have purchased by the barrel. Next came the 2015 Cabernet Sauvignon Vineyard 887, currently on the market but with not much left. Big and balanced, and good to go. Destined to be a 100-pointer when reviewed. The 2015 Oakville Vineyard Estate Cabernet in French oak has since been moved to a Piazza Reserve label (we would be tasting wine in a paired lunch there next). Gerard said his best wines come out of Oakville, and that the AVA produced higher priced wine. The south section is notably better than the north. He drops tons of fruit to make an intense wine for the 887 labels. This had more perfumy aromas to me, very welcoming. Onto a sample of the 2015 St. Helena Mountain Block 2 Cabernet Sauvignon. This wine also goes into the making of The Beast; making it more age worthy. The 2016 barrel sample of the Villa del Lago Pritchard Hill Cabernet Sauvignon – the 2014 garnered 100 points – should be bottled and ready for release in February of 2019. Gerard said that “some of the best wines are from Pritchard Hill.” Their vineyard on the east side, which is near the lake, allows the grapes to be cooled off at night. Most of these wines are only produced at between 12 to 14 barrels a year. They are either sold via VIP allocations or direct to consumer at the winery. They rarely sell wholesale to restaurants or stores. Gerard focuses on the vineyard over the winery, “We grow the wine in the vineyard” as he walks his vineyards, manages the canopy, isolates the weaker areas, looks at the clusters – all in his effort to make the finest wine for the average $200 per bottle price tag. The “winery work is a mathematical equation”, according to Gerard, while the vineyard doesn’t work that way. Not as grand in size as The Estate but just as appealing, the Piazza focuses on food and wine pairing with seated tastings and two different menu experiences. When you arrive here you will notice the bright yellow two-story tasting room, rustic ceiling, fountain and gardens – which will soon be dwarfed by the caves, with large portals (what doors leading into caves are called) and a hospitality area currently under construction. Stay tuned, as caves will most likely open in phases over the next three years. The Piazza itself just opened in September of this year. Entering the Piazza you will notice the large open kitchen on your right, the tasting bar on your left, another tasting area directly in front, and just outside the doors are several tables set up for the wine and food pairing experience. Gerard took us upstairs where there were several seating arrangements for guests as well as a conference table set up for a large meeting and/or tastings. Chef Josh Schwartz, formerly of The Laundry and one of many chefs in Napa in the TKG (the “Thomas Keller Group” as jokingly referred to by Gerard) and sommeliers work together on two different menus. The four “Poppers” isn’t not what you think of when you think poppers, these are four small bites created for the sole purpose of pairings. The second menu is called the “Delicacies Tasting Menu.” We had samples from each that included a cheese and fruit plate; Maine Lobster Roll on Toasted Brioche paired with the 2014 Piazza Chardonnay, Sonoma Coast Cinghiale Vineyard; Snake River Farms American Wagyu Beef Piccoburger with Black Truffle paired with 2014 Piazza Reserve Cabernet Sauvignon Napa Valley and the 2014 Piazza Oakville Estate Cabernet Sauvignon; and finally the sous chef presented Cabernet sorbet. It was both a grand experience and an enlightening one as we discussed how each pairing worked out. 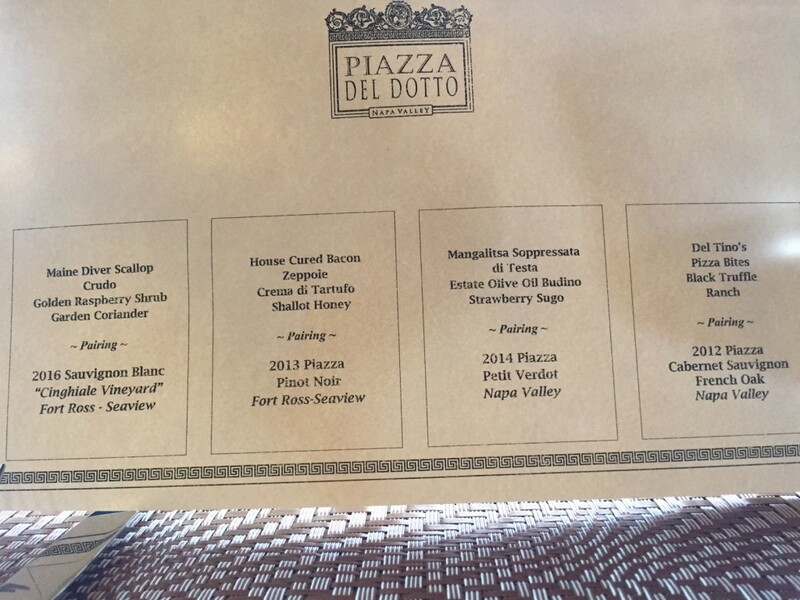 The wine list currently includes tasting from the Estate as well as Piazza labels. The Chard mentioned above is made with California clones and is French oak aged. We also enjoyed a 2016 Rose of Pinot Noir from the Cinghiale Vineyard. A treat for me was a rather tasty and easily affordable $45 2014 Petit Verdot what was from St. Helena Vineyard. There are only about 200 cases of this wine, their first foray into Petit Verdot. August 2017 (Paso Robles, Calif.) – Spend a day soaring over vineyards and exploring underground caves before breaking wine pairing rules while dining on farm-to-table fare. When visiting members of the Paso Robles CAB Collective (PRCC), guests can expect sensational experiences that accompany the highly acclaimed wines. “The Paso Robles wine region is constantly innovating, and one of the ways our members do so is to make guests a priority and offer them encounters that are memorable,” says PRCC President and Ancient Peaks Winery co-owner Doug Filipponi. For the thrill seeker, Ancient Peaks Winery has created Margarita Adventures, which offers zipline tours over historic Santa Margarita Ranch. Guests can soar along six distinct ziplines, starting with two epic rides over Cabernet Sauvignon vines on the 2,800-foot Double Barrel tandem zipline and the 1,300-foot Renegade zipline. Afterward, visitors can relax in the winery’s tasting room and sample Ancient Peaks’ red Bordeaux varietals, Cabernet Sauvignon, Merlot, Malbec, Petit Verdot and Oyster Ridge, a Bordeaux-style blend. 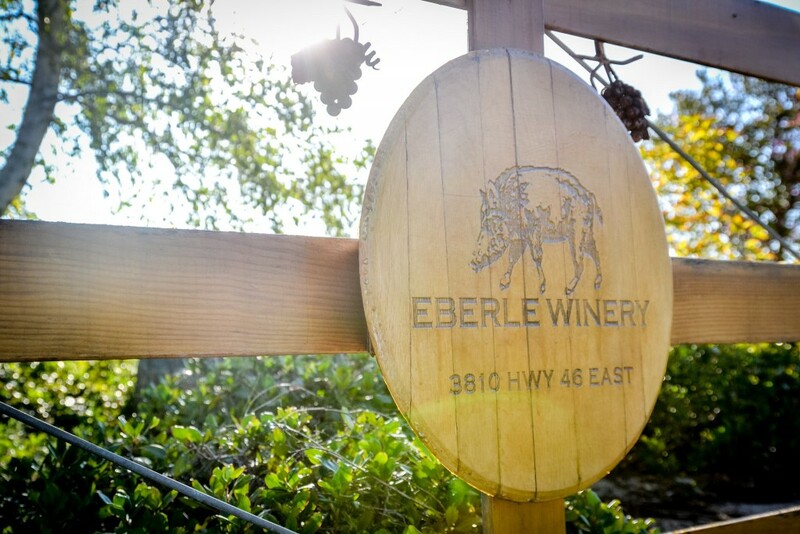 Guests can balance soaring over the vines with exploring underground caves at Eberle Winery. Built as a place to age the wines, the 16,000 square feet caves include the 100-seat Wild Boar Room, and can be visited during daily tours. The winery hosts their monthly Guest Chef Dinner Series and special events in the caves, which serve as a romantic and unique backdrop. Founder Gary Eberle, known as the “Godfather of Paso Robles wine,” was one of the first to plant Cabernet Sauvignon in the region, offering his first vintage in 1979. Guests can expect to enjoy current vintages of the same varietal during their tour. 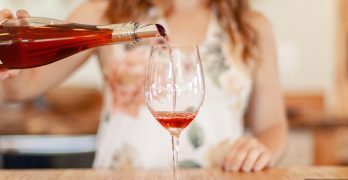 At Allegretto Vineyards & Wines, the focus is on food and wine pairing, but not in the traditional manner that experienced oenophiles come to expect. Each wine is poured in its own glass to honor its unique, elegant and balanced flavor profile, with guests encouraged to set their own pace of enjoyment. Here the emphasis is put on flavor and teaching guests the technique of “flavor balancing.” Educating guests to understand why they like certain wines and then balancing them with food allows for unconventional pairings, such as the Allegretto’s Cabernet Sauvignon with Grilled Halibut. The theory Allegretto embraces is to pair the wine with the diner, not the dinner. 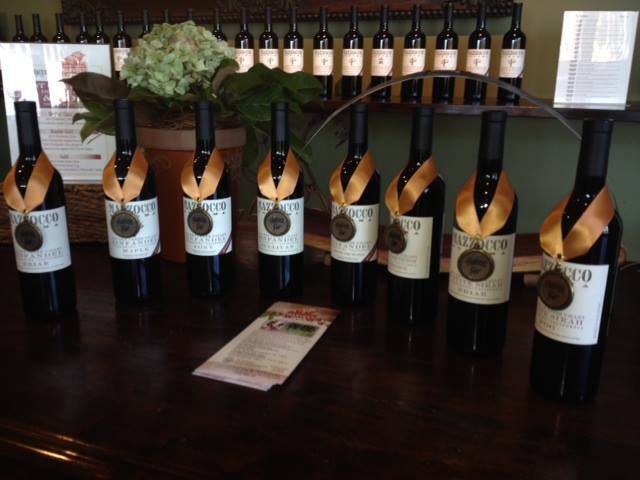 Once visitors have learned how to pair wine with food, a visit to JUSTIN Vineyards & Winery is a must. Guests are encouraged to browse the herbs, strawberries, squash, lettuce and edible flowers that renowned Executive Chef Will Torres might pick for the featured dish that evening. These farm fresh ingredients are designed to pair with JUSTIN’s Merlot, Petit Verdot, Malbec, Cabernet Sauvignon and signature ISOSCELES blend. The winery also offers daily production and vineyard tours that include access to the Founder’s vineyard, barrel chai and ISOSCELES library. A day spent visiting the wineries of the Paso Robles CAB Collective offers an unlimited variety of encounters paired with the enjoyment of top caliber wines. Members are committed to creating experiences that are as memorable as each of the wines. Sponsors of the Paso Robles CAB Collective are: Smurfit Kappa, The Tasting Panel Magazine, The Somm Journal, Seguin Moreau, Fiji Water, Paso Robles Wine Country Alliance, The Bottle Meister, Martinez Farming, Travel Paso Robles Alliance, Encore Glass, Umpqua Bank, Nomacorc, Heritage Oaks Bank, Cork Supply, Crop Production Services, Farm Credit West, Lafitte Cork & Capsule, TricorBraun, Moss-Adams, Peltier Glassworks, Portocork, Longcrier & Associates, Glenn Burdette, The Blueprinter, Vineyard Professional Services, and Breakaway Tours and Event Planning. The 28 distinguished wineries of the Paso Robles CAB Collective are: Adelaida Vineyards & Winery, Allegretto Vineyards & Wines, Ancient Peaks Winery, Brecon Estate, Calcareous Vineyard, Cass Vineyard & Winery, Castoro Cellars, Chateau Margene, Clos Solène, DAOU Vineyards & Winery, Eberle Winery, Halter Ranch Vineyard, Hoyt Family Vineyards, J. Lohr Vineyard & Wines, JUSTIN Vineyards & Winery, Lions Peak Vineyards, Niner Wine Estates, Opolo Vineyards, Parrish Family Vineyard, Pomar Junction Vineyard & Winery, RN Estate Vineyard & Winery, Robert Hall Winery, Rotta Winery, San Antonio Winery, Sextant Wines, The Farm Winery, Treana Winery and Vina Robles Vineyards & Winery. Formed in 2012, the Paso Robles CAB (Cabernet and Bordeaux) Collective (PRCC) is an independent collaborative effort of leading Paso Robles growers and producers of Cabernet and red Bordeaux varietals specific to the Paso Robles AVA in California. The PRCC strives to promote to trade, media and consumers the full potential of the Paso Robles region in producing superior quality, classic and age-worthy Cabernet and red Bordeaux varietals that compete on a global stage. For more information, please visit www.pasoroblescab.com. Out of more than 1800 entries from 44 states, Little’s recipe rose to the forefront, bringing her to the semi-finals and ultimately to the winner’s circle at the final cook-off at Gloria Ferrer Winery on Saturday. The judges unanimously enjoyed her recipe. “I just loved the way the miso married so well with the Gloria Ferrer Sonoma Brut,” said award-winning talk show Host Joel Riddell. “I definitely thought it was the most complex dish. There were so many layers of flavors. Every bite stood out and different elements played nicely with the wine,” said Sommelier, Wine Educator and Journalist Christopher Sawyer. “I think we all agreed that this dish was really beautiful to look at and beautiful to taste. It had it all the elements going on – bitter, salty, sweet—just a great dish,” according to Sara Deseran, Food Writer and Editor-at-Large for San Francisco magazine. 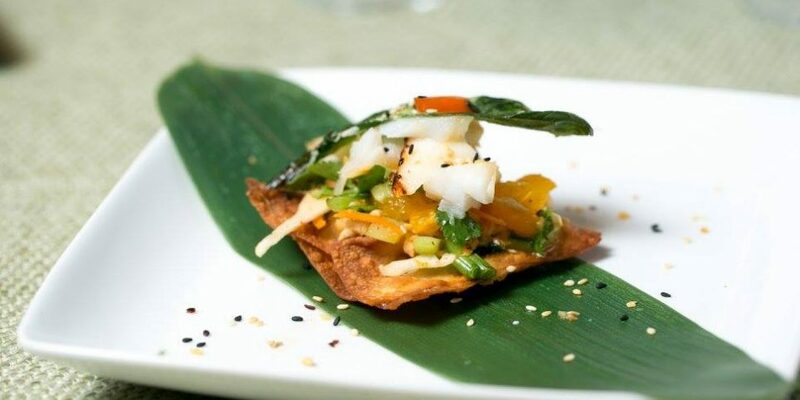 All finalists’ appetizers were judged on originality, taste and ability to pair with the Gloria Ferrer Sonoma Brut. 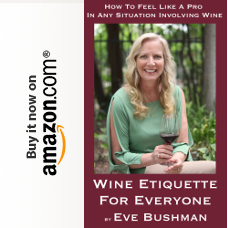 During the competition, the more than 200 guests in attendance were entertained by TV Host, Wine Expert and Author Leslie Sbrocco, known for her appearances on NBC’s The Today Show and as the host of Check Please! Bay Area and her newest show Taste This. Attendees also voted on their favorite appetizer from among the four finalists. Taking home the popular vote, or the “Pop Award,” was Diane Williams of Auburn, California, for her Triple “B” Won Tons with Beef, Blue Cheese and Bacon. A pioneering history and approach to Pinot Noir and Chardonnay have made Gloria Ferrer Caves & Vineyards a leader in California sparkling wine for almost 30 years. Founded in 1986 in Sonoma, California, by the Ferrer family of Spain, Gloria Ferrer combines the best of sparkling winegrowing history with the bounty of the Carneros winegrowing region using time-honored méthode champenoise winemaking traditions and centuries-old sustainable practices. Gloria Ferrer produces the most awarded California sparkling wines that have won over 500 gold medals and received 50 outstanding 90+ point ratings in the last 5 years. Discover the Glorious Life at www.gloriaferrer.com . What a treat to tour caves at least at one winery in Paso Robles last week. Got us out of the rain, AND SNOW, and allowed us to imagine that we were dining at an exclusive candlelit wine dinner or an intimate wedding. Rows seemed endless, barrels calling out to us with their vintage years and types of oak, the perfect place to start a day of wine tasting. And our host? The winemaker at Eberle Winery: Ben Mayo. As Ben spoke he led us down below the tasting room, first to the winemaking area where some equipment – that is used outside – had to be covered up to protect it from the weather. Inside we saw the usual suspects: Gleaming stainless steel tanks. But then he led us a little deeper. Into the caves they had built to house the bazillions of wine aging in oak barrels. I wished and wished that he had a wine thief handy for an impromptu barrel tasting, but alas, it was my first winery of the day, and I was too shy to ask! throughout the summer season. A heat spike in early September brought fruit into the perfect physiological ripeness, readying the clusters for harvest. The 2009 vintage is the result of a stellar growing and ripening season.These wines are remarkably well-balanced, displaying concentrated fruit, intense flavor profiles and vivid color extraction. One of the best vintages from the Paso Robles Appellation yet! Eve: Floral aromas, as well as some grass and lemon, the taste had a nice honey against the acid, nice long finish. wines that display well developed flavor profiles with balanced acidity. Eve: Sweet yet tangy with some acid and a nice finish. The 2007 growing season while unique, has turned out to bean exceptional vintage for the Paso Robles wine growing region. Below average rain fall in the winter with warmer than normal temps encouraged an early bud break in the spring. Warm days and cool nights throughout summer brought early season varietals in at normal harvest times. However, a drop in temperature in late September delayed harvest for mid to late season varietals, increasing hang time and allowing fruit to come to the perfect flavor maturity. Overall, while crop yields were lighter for 2007, the result was a well-balanced, high quality vintage that displays concentrated fruit, intense flavor profiles and vivid color extraction. Eve: Nice mushroom aroma and ripe black fruit taste. My notes are falling away here, palate fatigue so soon? Say it isn’t so! 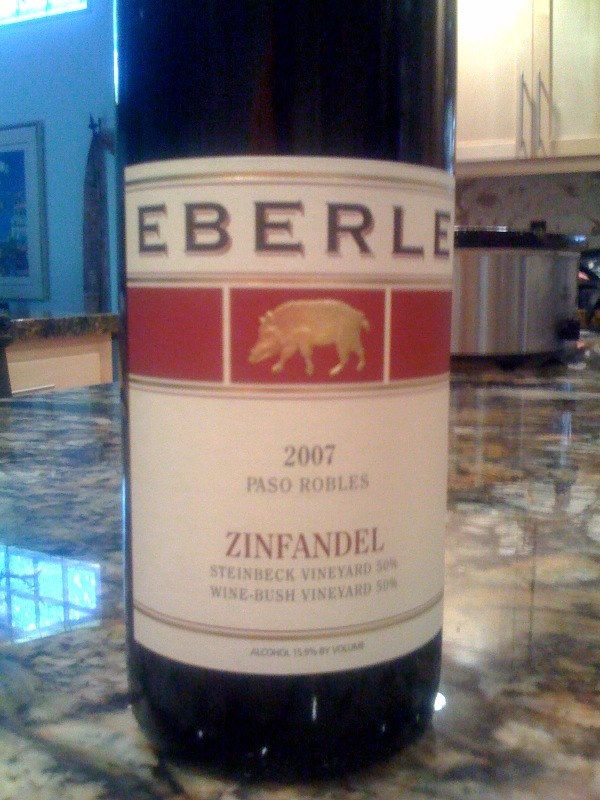 Eberle 2007 Zinfandel showcases two of Paso Robles finest Zinfandel vineyards, the reputable Steinbeck Vineyard and the Wine-Bush Vineyard. The Steinbeck Vineyard contributes layers of sweet briar fruit with hints of earth and minerality, while the Wine Bush Vineyard contributes depth of color and jammy flavors of ripe blackberry, red raspberry with a peppery finish. Eve: Very traditional Zin nose and a nice balance. All in my party agreed it was the best we tasted ! The 2008 growing season was challenging to say the least. A cool and relatively dry winter led to bud break in mid-March. An unexpected frost in late Spring followed by high winds caused “shatter”resulting in smaller berries and lighter yields. Warm temperatures during the summer with cool evenings brought along verasion at the normally expected time frame of mid-July. However, the latter part of Fall, brought cooler than normal conditions, slowing down ripening of berries but allowing more hang time on the vines. While 2008 was a challenging year, the resulting vintage displays well developed flavor profiles with adequate tannins and balanced acidity. Eve: Some grass, gaminess, nice dry finish. The growing season for 2003 began with a cool and wet spring, but warmed up mid-summer. A heat spell lasted through the months of May and June, which created some set and bloom issues. The remainder of the ripening season held ideal temperatures with warm days and cool nights. Although overall yields from harvest were lower from the smaller fruit clusters produced, quality of the berries was exceptional.